Ginseng and Astragalus Combination has classically been called the "King of Combinations." Codonopsis and Astragalus Combination has classically been called the "King of Combinations." It is a giant among classical tonic formulations. It is traditionally said to promote the production and circulation of Qi, support the digestive system and support nutrient assimilation, support the normal healthy functions of the immune system, to strengthen muscles that help to support posture and the normal healthy position of the organs. It is also an excellent blood tonic. Codonopsis and Astragalus Combination is used as a tonic by anyone wishing to tonify or maintain a high level of Qi. This is the classical Codonopsis and Astragalus Combination used for many centuries in Asia. What distinguishes Dragon Herbs Codonopsis and Astragalus Combination from other brands is the quality of the herbs used to produce it and the production technology. all herbs in china (and from most places) come in different grades based upon their variety, seed stock, growing source, growing conditions, care of the cultivators or collectors, and processing at various stages of the supply chain and during production. That's a lot to consider. But dragon herbs does take all these factors into account in selecting our raw materials and in producing our herbal products. Codonopsis and Astragalus Combination is so widely consumed in China that many domestic herb factories produce it. Most of this production uses low grade herbs for price reasons. Many of the peasants of China take Codonopsis and Astragalus Combination, so many factories produce it with very cheap materials so that it costs just pennies. Dragon Herbs does not use low grade, less effective, raw materials for Codonopsis and Astragalus Combination or any of its products. Dragon herbs identifies sources of the best raw material, the kind preferred in shanghai or hong kong by those who know herbs and want the best. We use this premium material to produce this important formula. Production technology also matters. Most factories just throw the herbs into a tank and cook the whole thing for a couple of hours, then they make a powdered extract of the tea using a lot of excipient (usually not natural). 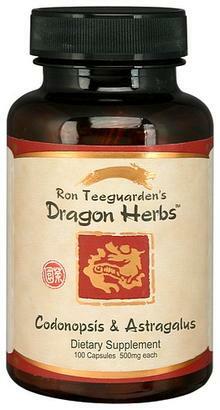 Dragon Herbs uses low temperature extraction using very pure water and no chemicals. We add the herbs carefully at incremental stages. Some of the herbs in Ginseng and Astragalus Combination can only be cooked for a few minutes. These "short cook" herbs are cooked separately and carefully and added at the end. For example, the Dang Gui should not be cooked as long as some of the other herbs because of its high aromatic oil content. Aged Tangerine Peel and Fresh Ginger must be cooked for just a few minutes at most because of their aromatic oil content. This is a true secret (revealed) of superior herbal production. One very important process that most factories skip involves the collection of aromatic oils from the tea. Real Ginseng and Astragalus Combination has a sweet-spicy aroma. This is from the aromatic oils in the herbs. If the herbs are overcooked and the oils are allowed to evaporate, the true power of Ginseng and Astragalus Combination cannot be achieved – even if good quality herbs are used. Since we use superb herbs to make this formula, the result is sublime. 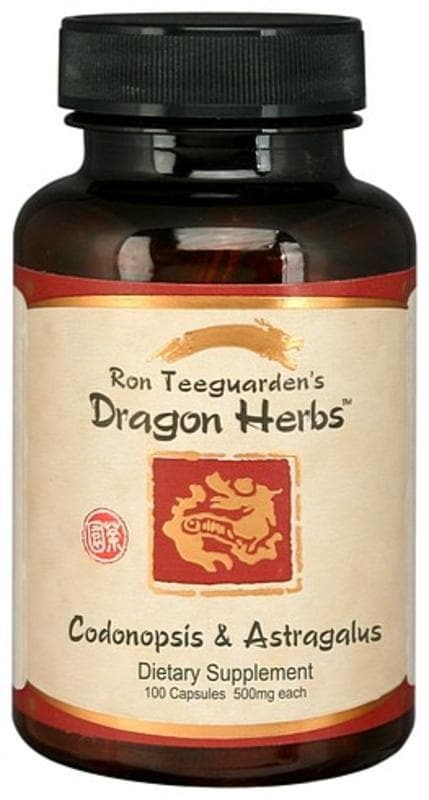 Dragon Herbs always processes it herbs using an "oil trap." An oil trap is a sophisticated device connected to the extraction system. It captures evaporating aromatic oils and collects them in crystallized form. These collected essential oils are therefore not lost. They are added back into the extract at the end of the process. And this makes all the difference! Ingredients: Codonopsis root, Astragalus root, Chinese Licorice root, Bai-zhu Atractylodes root, Aged Tangerine peel, Dang Gui root, Bupleurumroot, Chinese Cimicifuga rhizome, Fresh Ginger rhizome, Red Jujube fruit. Codonopsis root, astragalus root, chinese licorice root, bai-zhu atractylodes root, aged tangerine peel, dang gui root, bupleurumroot, chinese cimicifuga rhizome, fresh ginger rhizome, red jujube fruit.